Have your brakes check by Custom Deluxe Auto Services at least once a year - more often if you drive frequently in city traffic or live in a hilly area. If you hear a high-pitched squeak when you use the breaks, have them checked. If you hear a scratching or grinding noise when not braking, this also can be a sign of a break or bearing issue and should be inspected immediately. Check your brake fluid along with other car fluids. If you have to add fluid more than one every few months, you have a leak. 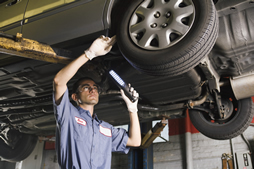 Here are some common signs that you should take you vehicle to Custom Auto Repair for brake service. Your vehicle pulls to one side when you apply the brakes. You hear or feel a scraping or grinding sensation during braking. You hear a high-pitched, piercing metallic sound while the vehicle is in motion. The "brake" light on the instrument panel lights up. 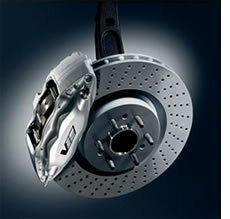 Our Certified Brake Safety Experts are dedicated to providing the best service in the marketplace. There's no one who cares more about your safety and satisfaction than Custom Auto Repair. Call us today for a FREE visual brake inspection and a really great deal.